The Medion Akoya E3211 offers great portability combined with decent office performance. Just dont expect to be playing Crysis! The Medion Akoya E3211 is a CULV laptop, or Consumer Ultra Low Voltage for the uninitiated. While it can't compete performance wise with many of the other laptops around this price, it is by far the most portable and will appeal to anyone who needs to work when regularly out and about. CULV laptops are targeted at people who frequently travel and need their laptops with them, so a long battery life and thin and light design is crucial. To achieve both of these requirements, an Intel CULV processor has been used in this laptop, alongside 4096MB memory. The processor is very resource light on the laptop's battery and you'll have 333 minutes of power to work with between charges. It also remains cooler than more powerful chips and so doesn't require a large cooling system, meaning the laptop's form factor can be kept down and the 1.8kg chassis will be no problem to carry around. Performance can't compare with the rest of the laptops at this price and the laptop is limited to running office applications, such as word documents, spreadsheets and email clients. An integrated GPU also means that multimedia functionality is very limited, and those after a laptop for editing video or photos should instead check out the Samsung Q320. The 320GB hard drive will provide plenty of room for all your files and data, and the integrated DVD rewriter lets you read data from and burn files to CDs and DVDs. 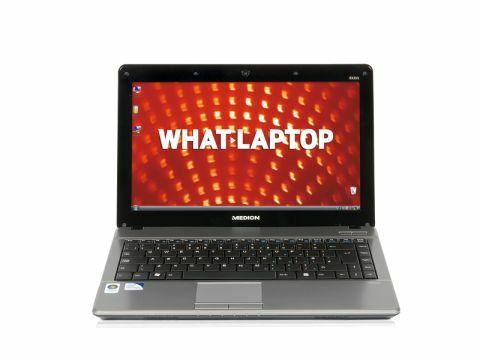 The 13.3-inch screen features a standard 1366 x 768-pixel resolution and is very sharp and bright. Colour reproduction is decent, but not as good as the PC Nextday. A shiny Super-TFT screen coating is in place, but suppresses reflections very well, meaning there's not too much of an issue in bright or rapidly changing light. Build quality is good, and the laptop is put together well, aiding durability on the road. The very shiny lid quickly gathers dirt and grime, however, and requires regular cleaning to keep it smart and tidy. The keyboard is comfortable to use and you'll have no problems striking up a fluid action, the only issue being that the keys are very flat and some might find it easy to get lost on the board when speed-typing. 802.11n Wi-Fi is joined by Gigabit Ethernet, making it easy to get online at high-speed wirelessly and also when using wired networks. There are also three USB ports for your peripherals and a VGA-out for connecting to an external analogue monitor when in the home or office. While the Medion Akoya E3211 can't compete power-wise, it is by far the most portable and ideally suited to those who need a portable partner to accompany them on the road.